Download the ISO built for PowerPC architecture (ppc64le). E.g. openSUSE-Leap-42.3-NET-ppc64le-Build0130-Media.iso. 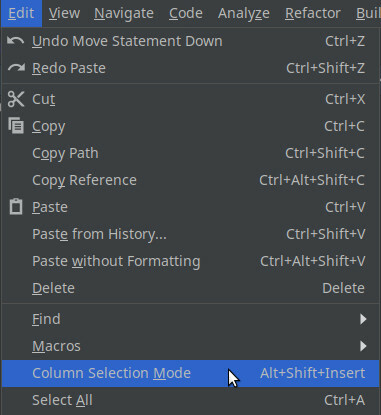 It’s easy to create vertical text block selection in IntelliJ Idea. After installing Linux in dual boot on the computer with Windows you may experience a strange problem. It’s no longer possible to shut down the computer from Windows. The computer immediately re-spawns to the Windows login screen. The issue is most likely caused by booting Windows from the incorrect bootloader. If you have two partitions (sda1, sda2) on the system, make sure that you’re booting Windows from the one with the operating system. Booting from incorrect partition could cause other strange errors, like problems with updating Windows. You can read more in the article: Failed to install Feature update of Windows 10, version 1803 on machine with Linux dual boot. I was chasing a very strange bug for a long time: Windows 10 was not able to install any feature update. To keep the long story short: I was starting Windows by the incorrect bootloader. Grub from Linux Mint auto-discovered two Windows partitions /dev/sda1 and /dev/sda2. The first partition was just a small partition with bootloader from the previous installation of Windows. When booted by “chainloader +1” the boot automatically kicked in and started Windows stored on the second partition. Unfortunately it had an impact on updates and shutdown of the computer. The correction was quite simple. Just start Windows from the second partition. I rebooted the computer from sda2 partition and then I started the new installation of Windows 10, version 1803 update using Windows 10 Upgrade tool. This correction also fixed another strange bug, that I was not able to shutdown Windows. When I selected “shutdown”, Windows respawned in a few seconds back into login screen. Again the problem was that old bootloader from the first partition kicked in, after the shutdown of Windows and resumed it. Big thanks to Max Green for pointing out that the problem might be caused by invoking incorrect bootloader. 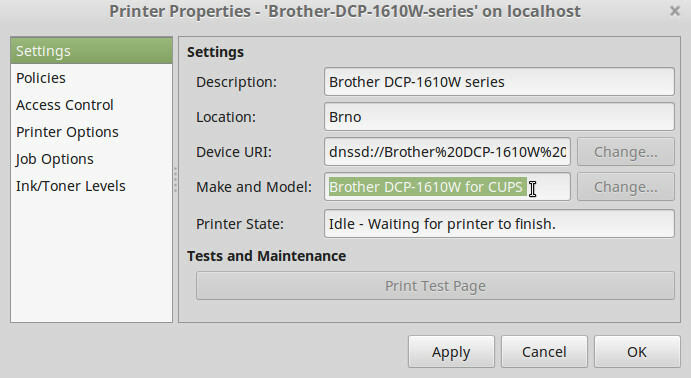 Brother DCP-1610W and DCP-1610WE are laser printers with WiFi support. The problem is that configuration files for printing are not part of common distributions like Linux Mint. You can try to use Foomatic driver for DCP-1200, but the result won’t be great. It’s necessary to install drivers from Brother. There is one gotcha. If you install just a CUPS Wrapper from Brother, it won’t work. You need to install LPR and CUPS packages.